The purpose of unlawful detainee proceedings is timely restoration of possession. Time periods for pleading [in unlawful detainee actions are shorter than ordinary civil actions; the matter is set for trial more quickly and they are entitled to priority on the trial calendar. 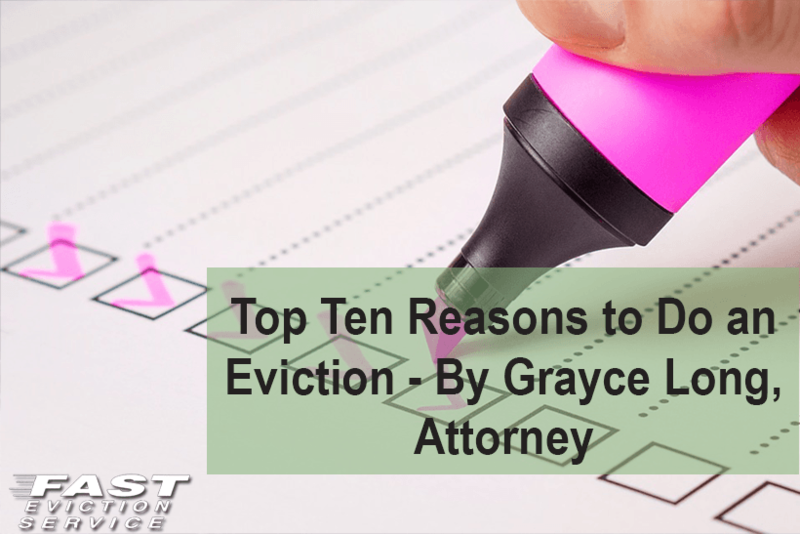 Thus, under California Law, these are the top ten reasons to do an eviction. This is the quickest and easiest way to evict your tenant. If your tenant fails to pay rent by the due date, serve a three day notice the next day! If the rent is due on the first of the month, it is delinquent on the second day of the month. You can serve a notice right away, if the due date does not fall on a weekend or a holiday. If so, you must wait until the following business day to allow the tenant to pay and then you can serve the notice. A common mistake is that the landlord and the tenant believe there is a five day grace period in their lease. NO! Generally, that is not true. Usually the grace period refers to when the tenant incurs a late fee. You can serve a three day to perform covenant or quit notice if the tenant fails to pay the security deposit. However, you must have a rental agreement that states that the tenant is required to pay a security deposit. If you have an oral agreement, then you cannot serve a notice. Remember, when you sign up a tenant and you do not get the entire security deposit, you must put in writing exactly the dates and the amounts of payments to be made. If they fail to pay any installment, you could serve a breach of covenant notice. Failure To Pay Late Fee Or Utility Charges. You can serve a breach of covenant notice for failure to pay late fees and or utility charges as long as it is specified in the rental agreement. There is also certain language regarding late fees that most courts require in order to win your case if you go on a breach of covenant. Specifically, the rental agreement needs to say that “the landlord will incur certain administrative costs in connection with late rental payment and the amount of such administrative costs are difficult to ascertain.” Check the AOA lease as it has the proper language. You can also evict a tenant and serve a notice if they fail to pay the utility charges that are due under the lease. You might also want to put a clause in your lease that allows you to deduct the utility charges first then rent from any payment received. This puts the tenant on notice that you mean business on the payment of utilities. Have you noticed strange people hanging out at your building? The normal rule is that any guest that has been staying at the property more than 14 days has exceeded their guest status. You can serve a three day breach of covenant notice for an unauthorized occupant. Remember, you can only serve this notice if your rental agreement states the number of occupants that can live at the property. When filling out the rental agreement initially, make sure that you identify by name the people that are allowed to live at the property and how many children can reside in the unit. If your tenant has someone else move in, make sure that you or your manager keeps a log of that extra occupant and the dates and times that you have seen that person at the property. You also need to have a witness who can come to testify in court that they have seen that extra occupant at the property. Usually that person can be the on-site manager. As long as you have a rental agreement that does not allow pets to be at the property, then you could serve your tenant a notice to perform covenant or quit and remove the pet. If you do allow pets, make sure that when filling out the agreement you specify what kind of pet, (i.e. a cat or a dog.) Make sure that you describe the dog and the size of the dog. There is a huge difference between having a poodle at the property versus the tenant having a Rottweiler. Evicting a tenant for pets can be very tricky. You again need to keep track of the date and times that you have seen the pet and try to take pictures of the animal or its bowl of food at the premises. You will also need a witness that will come to court to testify seeing the pet. Recently, there have been a lot of tenants that are claiming that the pet is a “companion pet”. Make sure that the tenant has a verified note from a doctor that states the pet is necessary. Beware of the tenant just registering the pet online as a companion pet. Does your tenant have papers, boxes, trash and clothes all over the unit stacked high to the ceiling? If so, then you have pack-rat tenant. You can serve them a breach of covenant notice as long as you have a provision in your rental agreement stating they must maintain the premises in a clean condition. In your notice, you would want to specify that the tenant has trash and belongings stored high to ceiling so that you can barely walk through the apartment. Again, you need to make sure that you have dates, times and witnesses of the event and pictures that you can show to the court. You are basically asking the tenant to clean up the unit. Has your tenant painted the apartment pink? Or installed a wall in the unit? As long as you have a written rental agreement with a provision stating that the tenant cannot alter the premises, then you can serve your tenant a three day notice to perform covenant or quit. You are simply asking the tenant to either remove the wall within three days or paint the premises back to the original condition. The majority of times, the tenant is unwilling to do anything. Make sure that you have dates, times and witnesses of the unauthorized alterations and that the witness can come to court to testify against the tenant. This is a new phenomenon but many tenants are advertising their unit on Airbnb when they plan to be out of town, so they can make extra money. Also, if the property is rent controlled, many tenants are just keeping the property and renting it out full time. This is a regular occurrence for many property owners in the Greater Los Angeles Area or units in desirable tourist places. If your rental agreement has a provision for unauthorized subletting, then you could serve a three day perform or quit notice for illegal subletting. If you have a tenant that is bothering other tenants, having loud parties or music playing at all hours of the day and night, you could serve your tenant with a nuisance notice to quit the premises. If the police have been called out to the unit several times this would bolster your case. This type of notice would not be curable, rather the tenant would be required to quit the premises. This would normally be a 30 or 60 day notice to quit, depending on how long the tenant has resided at the unit. You would again need a log of the manager or another person containing the dates and times that these noisy events have occurred. That person would also be required to come to court to testify. Similar to the noise notice, you could serve a quit notice for gang activity, drugs or nuisance. This also requires dates, times and witnesses. This can be tricky in a gang or drug situation because very few tenants want to get involved or testify in court. A letter from a tenant is not sufficient and it is considered hearsay. When preparing the notice you can state “witnesses afraid to be identified” and add in the manager or yourself as a witness. If there is a police report that can be effectively used in court or you could subpoena the officer. All of the above are reasons that you can evict your tenant. If your property is not rent controlled and it is on a month to month tenancy, you can always just serve your tenant a 30 or 60 day notice depending on whether or not they have lived at the property for over a year. If you have any questions, feel free to call my office and we can give you a free consultation.